The Business and Commercial Services Division of the Arkansas Secretary of State records all filings and incorporation's of businesses formed in the state. 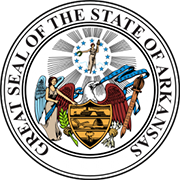 The Division keeps all information related to businesses registered in Arkansas. Types of business entities incorporated in the state include Corporations, Limited Partnerships, Limited Liability Companies and Limited Liability Partnerships. View the step by step guideline below on how to search for a business entity in Arkansas. 1. Go to the official website of the Arkansas Secretary of State and click on "Business Search" under the "Business and Commercial Services" section of the site to start your search. You can directly start your search by clicking here. It must be noted that filling out all the fields is not mandatory (but providing more information will assist in narrowing down your search). 2. To test out the Arkansas business entity search feature, lets search by name. 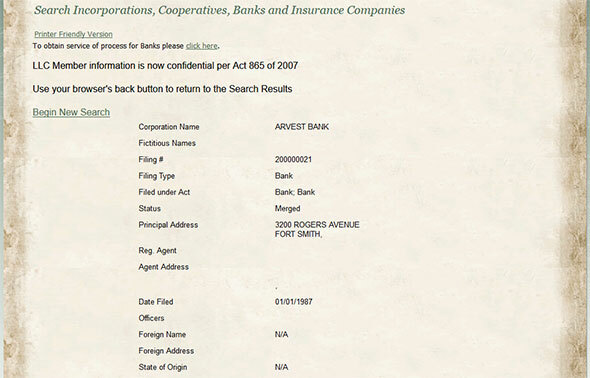 Type in the business name "Arvest Bank" in the entity name field. (See the screenshot below for reference). 3. Click on "Search" and the Results Page with a list of business entities will appear (as shown in the screenshot below). 4. You can click on the entity's name to access more details. The page looks similar to the screenshot below. The most senior political appointee within the state, the constitutional office of the Arkansas Secretary of State is responsible for carrying out a number of governmental functions. Currently, the office is held by Mark Martin.